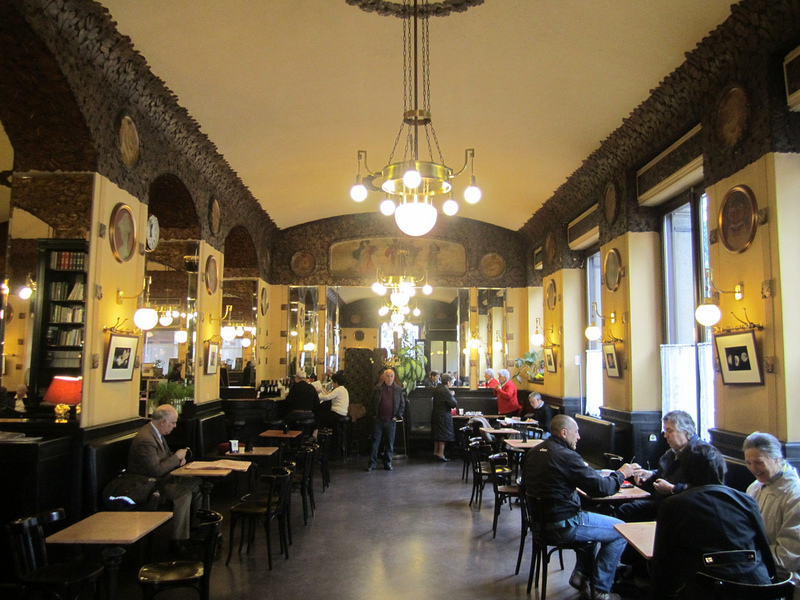 I’m just back from the Trieste Joyce School (June 30 – July 4) where I had the thrill of reading in the beautiful Art Deco Caffe San Marco, above, one of James Joyce’s many hang-outs in the city. Founded in 1914, when Trieste was still part of the Austro-Hungarian empire, the café was a meeting place for the city’s writers, radicals, and intellectuals. During Joyce’s ten years in the city beginning in 1904, he was a regular at the San Marco along with Triestine poet Umberto Saba and novelist Italo Svevo (often thought to be the model for Leopold Bloom in Ulysses). It still attracts a literary crowd; in 2013 when the cafe was under threat of closure, writer and academic Claudio Magris, who regularly writes at a table there, made an impassioned plea to save the San Marco, describing it as “a place where you’re at peace, you read, you write, you chat. . . a heart of the city; a strong heart that beats calmly”. The café has survived and hosted several events at the Trieste Joyce School. Now in its 19th year, the school is led by the calm and genial Irish scholar John McCourt, author of The Years of Bloom, about Joyce’s years in Trieste. He could be said to be following in Joyce’s footsteps as he has lived in Trieste since 1990. His local knowledge came to the fore during his immensely informative – and entertaining – walking tour where he brought to vivid life Joyce’s Triestine years. It seemed a little bit like coals to Newcastle reading from Dubliners 100 – Tramp Press’s centenary publication of new versions of Joyce’s stories ─ to Joycean scholars in a regular haunt in Joyce’s adopted city. (I rewrote An Encounter – see elsewhere on this blog.) But they were a great audience – despite the fact that it was a very hot night. But there were other echoes in the Joyce story that chimed with the experience of Bella Casey. When John McCourt talked about the relationship between James and his brother, Stanislaus, who came to Trieste on James’s urgings, the tensions he described seemed very familiar. Stannie was a steady provider and a loyal – and very practical ─ supporter of his brother’s genius. He regularly saved Joyce and his family from penury, found them accommodation or shared his own with them. He was a fixer, debt-payer and first reader for his brother, but his was often a thankless role. After they became estranged – Stannie was less than enthusiastic about Ulysses and dismissed Finnegan’s Wake entirely – Joyce is said to have dismissed the loss of a brother as no more serious than mislaying a pair of gloves. In the Casey family, Bella was often the one with her hand out. After her husband died, she was destitute, left with five children to raise alone, and she was forced to return to the family home, where O’Casey still lived. It was a situation that O’Casey deeply resented. Perhaps all this proves is that both Joyce and O’Casey were utterly single-minded in the pursuit of their art and that nothing – least of all the circumstances or the finer feelings of their siblings – was allowed to interfere with the work in progress. Thanks for your comment. I’m imagining it is possible, however, that Joyce could have frequented the San Marco between its opening in January 1914 and its destruction in May 1915. Really enjoyed this article. I enjoyed learning about Joyce and Trieste. Didn’t know the San Marco had been on the verge of closing, but so many historical places are in danger now, here in Italy. Let’s hope for the best. Thanks for your interest – it always seems to me, as a frequent visitor to Italy, that the Italians are good about preserving their heritage. What I mean is that, because of the tough economic moment, many historic places are cloning down. I’m not talking about palaces or museaums, but about historic cafè, historic bookshops, historic libreries. People think less about these things, because often these places are still operating, and so maybe people think it’s the owner’s business to keep them open. But I think that when one of these places folds, a tiny part of history is lost.